I’m coming to you from the 3rd row of a Lexus RX. And this is the first time anyone’s been able to say that because after years of pleading, Lexus has finally answered the call for an additional 2 seats in their most popular SUV. For a company that does so well with the Highlander it’s curious that this new RX L hasn’t happened sooner. But now it’s here and available as the V6-powered 350L in front or all-wheel drive or like this, the 450hL with the gasoline-electric hybrid powertrain exclusively with 4-wheel traction. Pricing starts at $48,795 including delivery. That equates to a $4,200 premium over the 5-passenger RX for what amounts to an additional 4” in vehicle length and seating for up to 7 depending on the 2nd row configuration. A bench-style seat is an alternative to these captain’s chairs. But if you’re thinking this is a Lexus Highlander, you’d be wrong. Despite the stretched body and steeper tailgate design, the RX L provides less passenger and cargo volume and thus loses 5” in 3rd row legroom to its Toyota counterpart. By every interior measure, this Lexus is smaller and it’s not even close. So, about this 3rd row; it’s really small. And I’m talking total kids’ fodder here and even then they’d better be the smaller ones in their grade. Now, the mechanisms in place to configure the various seats are very good but I don’t believe this is the 3rd row RX owners have been clamoring for. The 3rd row seats are power controlled from the rear or the 2nd row so that’s smart. And the captain’s chairs slide, recline and easily get out of the way for access to the back seats. But unless those riding in the 2nd row are willing to move all the way up there’s virtually no legroom in the 3rd row. It does get its own climate controls and there’s clever underfloor storage for items like the tonneau cover. And on occasions when you’re using all 3 rows and still need to haul stuff, there’s some space here to still do that. Forgetting about 3rd row practicality for a minute, I do like how Lexus designers handled the lengthening of the body including this very cool chrome strip that dives down at the rear. And this Autumn Shimmer paint is gorgeous, particularly when bathed in sun. It’s been 3 years since the last RX redesign but it’s doing a fine job of maintaining its edgier styling. 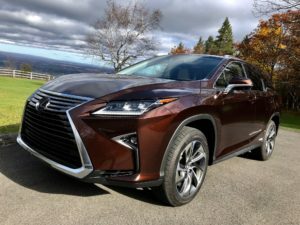 My hybrid tester is loaded with just about everything Lexus offers on the RX for a lavish experience that’s hallmark Lexus. The RX is extremely popular because it’s so easy and agreeable, from just the right step in height to the super soft comfortable seating to the low cowl excellent visibility to how good the wood and leather feel in the hand; the car to user handshake is spot on and is extremely welcoming. It’s handsome, it’s really quiet and, for most part, easy to use. And I say most part because of this unfortunate piece of technology. What more can I say about Lexus Enform that I haven’t already said a hundred times – it’s outdated and clunky to use – but, this cabin is beautiful, ultra comfortable and of course, quiet. A real luxury experience you’d expect from Lexus with lots of stress reducing amenities. The materials are rich. Fit and finish is top notch. Everything is automatic – like the high beams. A panoramic roof would certainly be nice but this stocked RX with the Luxury Package, incredible sounding Mark Levinson Premium Audio Package and techy safety features such as the awesome 360 degree monitor leaves you for wanting very little. There are no USB ports in the rear, no CarPlay, no Android Auto, that’s really the area where the RX is lacking. Here’s the deal with the RX. It’s a soft, quiet, pleasant ride with excellent visibility and a great drivers helm. But the hybrid powertrain just waters down the luxury experience too much to make sense. It feels like old technology and does not satisfy the driver. The gas mileage is good but at what cost? For me, I’d stick with the regular gas engine and then you’d really have something here. The old fashioned battery and lack of harmony between the 3.5-liter engine and the electric motors is enough for me to issue a pass on the hybrid. It does produce 308 horsepower and accelerates to 60mph in 8.1 seconds but it’s just not a pleasing delivery with the electric continuously variable transmission throwing a wet blanket on the process. And there’s very little pure electric driving. But the mileage gains are legit, particularly in around the town driving. This one returns 29mpg and a 500 mile driving range besting the 350 L by 8mpgs and a hundred miles of distance. The regenerative braking feels very normal but the extra 500 pounds the hybrid carries is notable when driving in the country as it pertains to athletic handling attributes. There’s a Sport mode but the RX is a luxury SUV and that’s what it does particularly well with a soft, forgiving ride quality and smooth curve tracing. Checking in at about $65,000 as-tested, the RX 450h L is probably better off as a $50,000 Toyota Highlander Hybrid Limited Platinum.